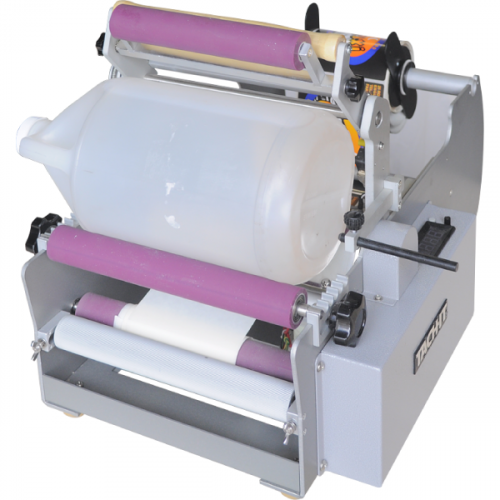 Premium Semi-Automatic Label Applicator for bottles and cylindrical products. Simply put container to be labeled into the machine and press the foot pedal and a label is applied smoothly and consistently. Powered overhead pressure roller adheres label to the container. Heavy duty construction and product fixtures for consistent label placement. Can apply 1 label or a front and back label (must be alternating on label web). 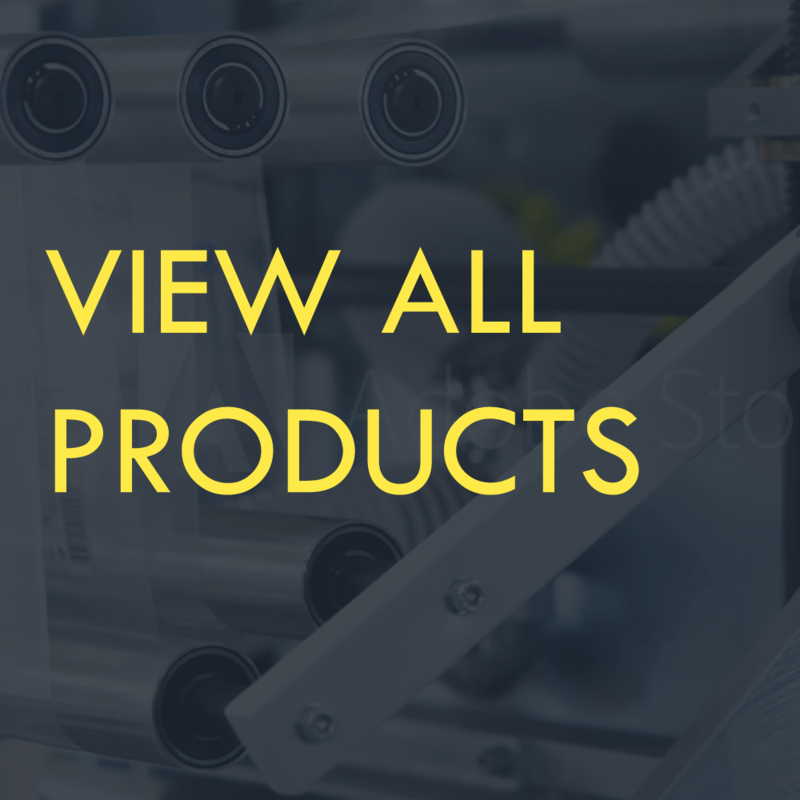 Perfect for micro-breweries, wineries, jams and jellies, perfumes and cosmetics, medical and for users who cannot justify an automated in-line labeling system. Adjustable product cradle accommodates various diameter products. Easy to load, no special training or tools needed. Semi-automatic bottle labeler: the Tach-It LB-2 semi-automatic bottle and cylindrical product labeler is designed to meet the needs of growing companies, lower volume users, specialty packers, or as a backup for fully automated equipment. Easy-to-use for any round bottle or container ranging from ½ inch to 4 inch inch diameter, the LB-2 has built-in product fixtures for consistent placement and automatic overhead pressure arm. It can apply a front label or a front and back label (with alternating labels on the web), is built for 24/7 productivity, and has a powered rewind for the waste. 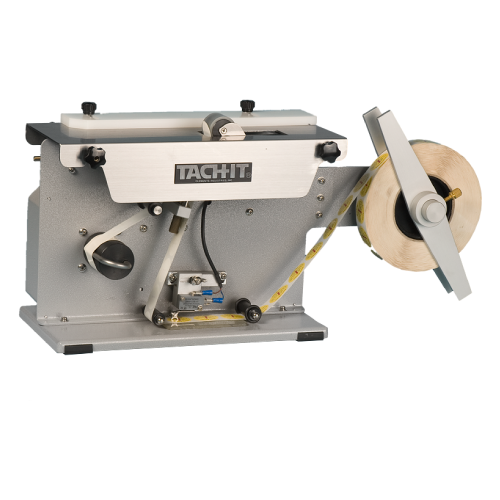 The Tach-It LB-2 is designed to handle label rolls up to 12 inch in diameter on a 3 inch core. No special operator training is required as setup and controls are easy to use and understand. 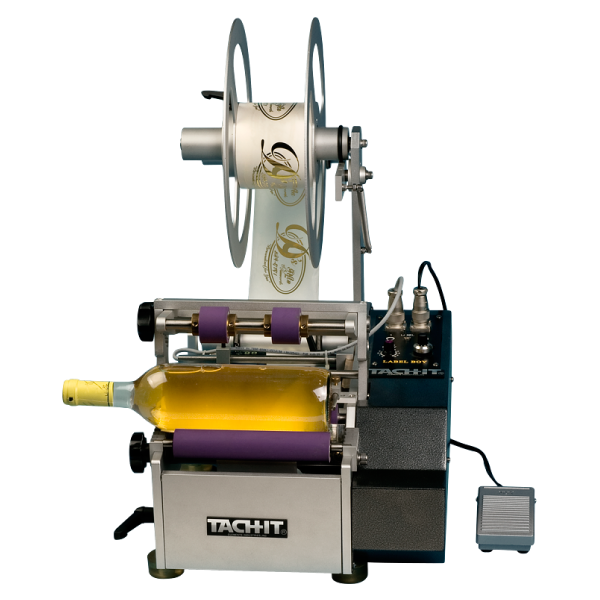 Unlike many other bottle labelers in the industry, the Tach-It LB-2 does not require air, has a small bench top design for use anywhere, requires no tools for label changeover, and has high friction, non-slip silicone rollers for positive feed of the labels and rotation of the product. To use the Tach-It LB-2 simply place the product into the adjustable cradle assembly and step on the foot pedal. The automatic overhead pressure arm will come down holding the container in place and the container will rotate and either 1 or 2 labels will be quickly applied. The machine is now ready for the next cycle. Note: all labels used on the LB-2 must be die-cut and have a minimum 1/8 inch (3mm) gap between labels.